Excited for Thanksgiving and the holidays, but hoping to avoid the dreaded holiday weight gain? We’re with ya! The good news is that if you heart is set on enjoying traditional Thanksgiving dishes, you can still enjoy your favorite flavors while cutting back on calories, fat, and sugar. 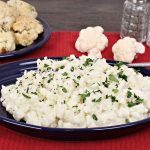 Try including cauliflower in your mashed potatoes, or serving mashed cauliflower on its own, for a leaner side dish. Skinny Taste’s Skinny Garlic Mashed Potatoes and Skinny Garlic Sweet Potato Mash have 151-165 calories per serving and around 3 grams of fat. 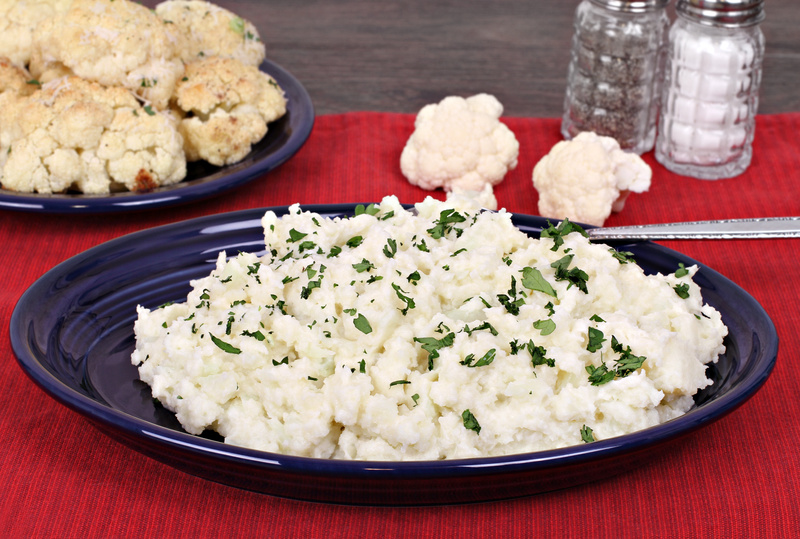 Eating Well’s Mashed Cauliflower recipe gets great reviews and has 107 calories per serving with 7 grams of fat. Not ready to go full mashed cauliflower? Dip your toe in the water with this Rosemary Potato and Cauliflower Mash recipe from Bowl of Delicious, which has 154 calories and 3.7 grams of fat per serving. Try swapping potatoes for turnips! Spruce recommends this Easy Delicious Mashed Turnips recipe as a complement to any hearty roasted meat dish, and has just 76 calories and 5g fat per serving. Mix the two with Martha Stewart’s Turnip and Potato Mash, which has 120 calories and 3 grams of fat per serving. Green Bean Casserole: Green bean casserole is a sleeper when it comes to unhealthy holiday dishes. We plugged a popular recipe in MyFitnessPal and saw it clocks in at almost 300 calories and over 13 grams of fat! While most dishes may not be quite that loaded, many clock in at over 200 calories per serving. The American Heart Association’s light Green Bean Casserole has 77 calories and 2 grams of fat per serving. Food Network’s Paula Deen shares a Honey Balsamic Green Beans recipe that has great reviews, and comes with just 83 calories and 4 grams of fat per serving. Emily Bites’s Garlic Roasted Green Beans with Almonds will bring amazing flavors to your table with just 80 calories and 5 grams of fat per serving. The Kitchn’s Stove Top Steam-Fried Green Beans with Mushrooms provides the classic casserole flavors with just 108 calories and 4.5 grams of fat per serving. Sweet Potato Casserole: With its layers of ‘mallows and brown sugar, sweet potato casserole is more like desert than a side dish. A typical version can pack around 215 calories, 9 grams of fat, and over 20 grams of sugar. The good news is you can leverage the natural sweetness in sweet potatoes to create healthier dishes with similar flavors. 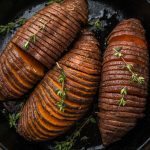 Hasselback sweet potatoes are an eye-catching, delicious, and healthy alternative to sweet potato casserole. Ellie Krieger of the Food Network provides a lighter recipe that has 160 calories and 4 grams of fat per serving. 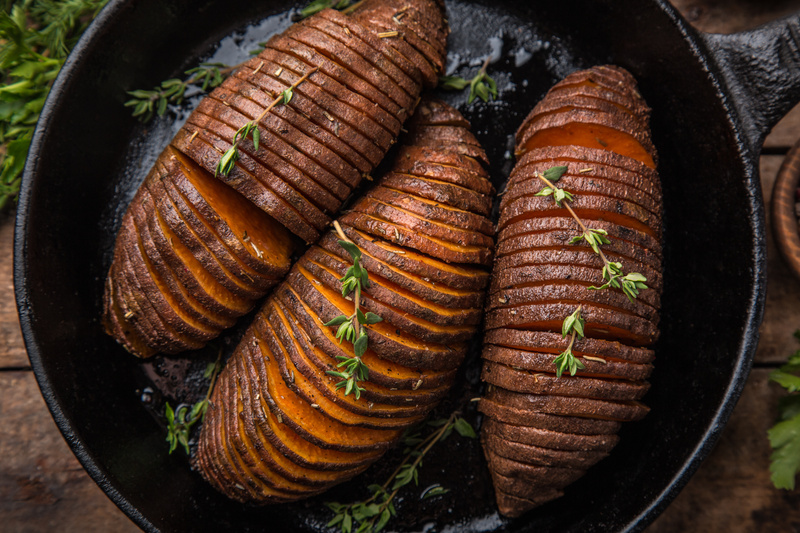 Try Hasselback Sweet Potatoes for amazing flavor and fun presentation. Food Network’s recipe has just 150 calories and 4 grams of fat per serving. Health.com’s Roasted Maple Butter Sweet Potato recipe will bring sweetness to your table with just 155 calories and 3 grams of fat per serving. Try this Honey Cinnamon Roasted Sweet Potato side dish from Buns in My Oven for classic flavors with less than 100 calories and 7 grams of fat per serving. They Mayo Clinic’s Wild Rice or Quinoa stuffing has just 91 calories and 3 grams of fat. Martha Stewart’s Healthy Harvest Stuffing has 258 calories and 9 grams of fat per serving, and comes with 6 grams of fiber. Want a paleo stuffing recipe? Try this one from 40 Aprons for a dairy- and grain-free version that clocks in at 269 calories per serving. This Easy Gluten Free Stuffing recipe from Food Faith Fitness is a great choice if cooking for gluten-sensitive guests, and only has 188 calories and 9 grams of fat per serving. Dessert: You can satisfy your sweet tooth without destroying your day! There are lots of recipes for lightened-up holiday treats. 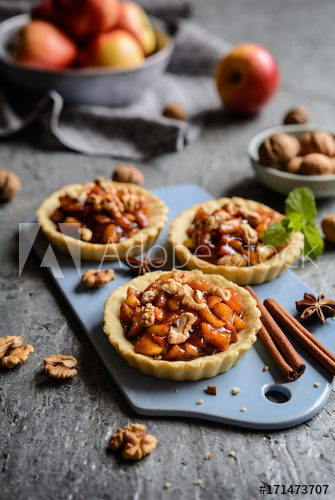 Also consider making smaller-portioned desserts, like these Mini Apple Crumble cups! They’ll bring charm to your table, and make it easier for you and other health-conscious diners enjoy a sweet treat without going overboard. 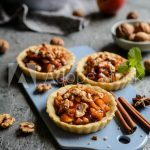 Try making mini desserts for charming presentation and healthier portions. Skinny Taste’s Skinny Pumpkin Pie has just 137 calories and 5 grams of fat per slice. Try these Paleo Pumpkin Pie Bites from Recipe Runner for just 107 calories and 7 grams of fat per serving. Love apple pie? Amy’s Healthy Baking’s Ultimate Healthy Apple Pie has just 129 calories and 4.4 grams of fat per serving. Bakerita’s Gluten Free Pecan Pie Bars will satisfy your pecan pie craving in a healthier way, with just 144 calories per serving and 6 grams of fat per serving. Remember, even swapping out a few dishes for lighter or more nutritious fare can make a difference when it comes to holiday weight gain and your overall health. So try lightened up, whole-food versions of your favorite recipes to make this the year your holidays get off to a healthy start!